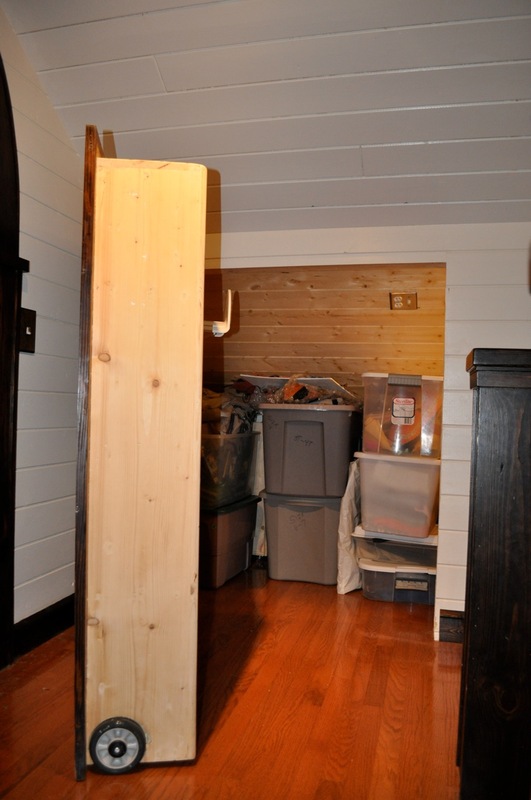 This is the doorway to the bedroom my sons share. Funny, you’d think this would be the messiest room in the house— two boys sharing a room. But guess what? It’s the neatest! Yes, after eleven months of paint-staking attic renovations (by my brother-in-law) and one home equity loan later, our boys prefer sleeping in the guest room downstairs. But I digress. The wooden arch was carved from a tree branch in my brother-in-law’s backyard. Double pocket doors slide closed for privacy when they’re older. Whether the boys sleep up there or not, this is one of my favorite rooms in the house. We had to utilize every inch of space so we wouldn’t have to change the roof line of our house. The book Making Room was my bible and a source of “ewe”nique ideas for how to make the most of our small space. 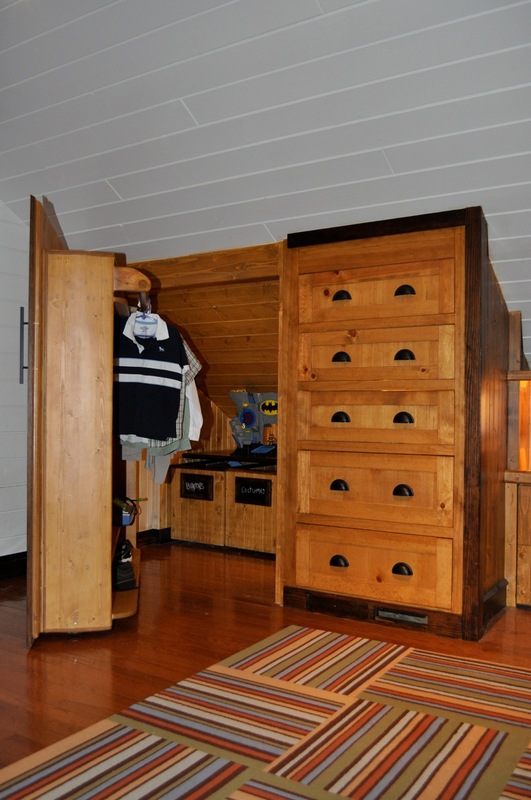 • Matching closets on each side of the room with rolling doors that hold hanging clothes and shoes. 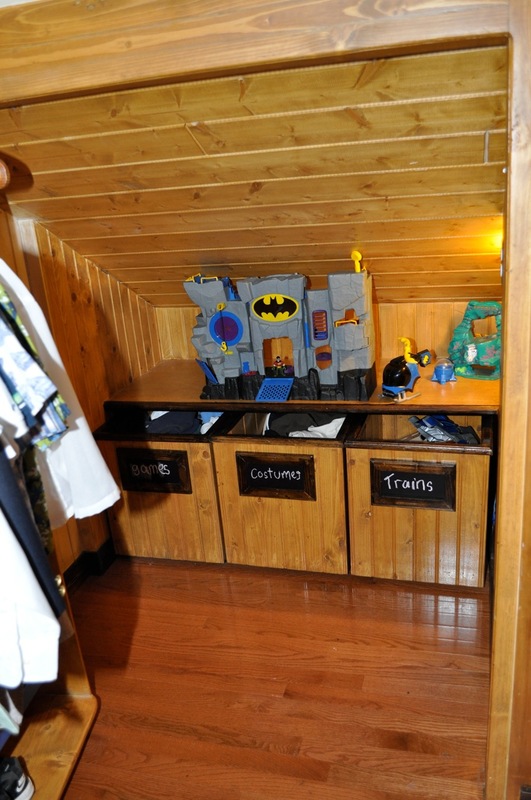 closets as secret play spaces. • 20″x20″shirt stripe carpet tiles from FLOR.com bring out the boy in the room. 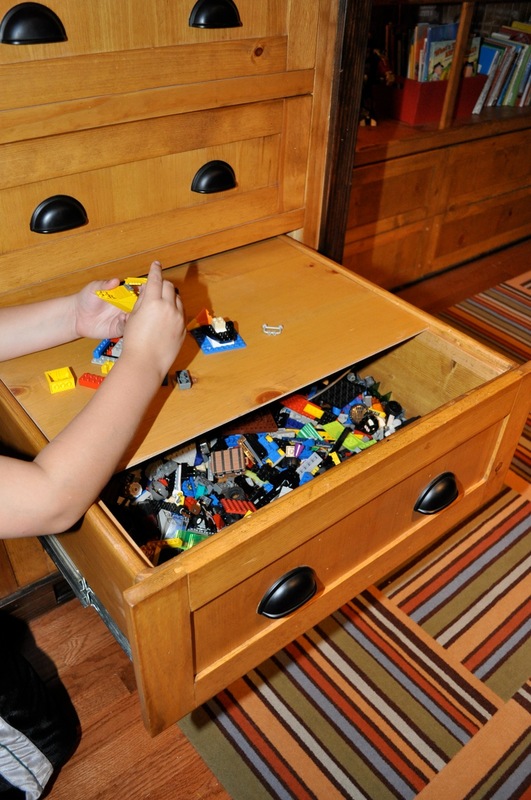 • Built-in dresser drawers on each side of the room hold the rest of their clothes and their favorite Lego drawer opens out 3 feet and has a sliding table top for easy lego construction and breakdown. 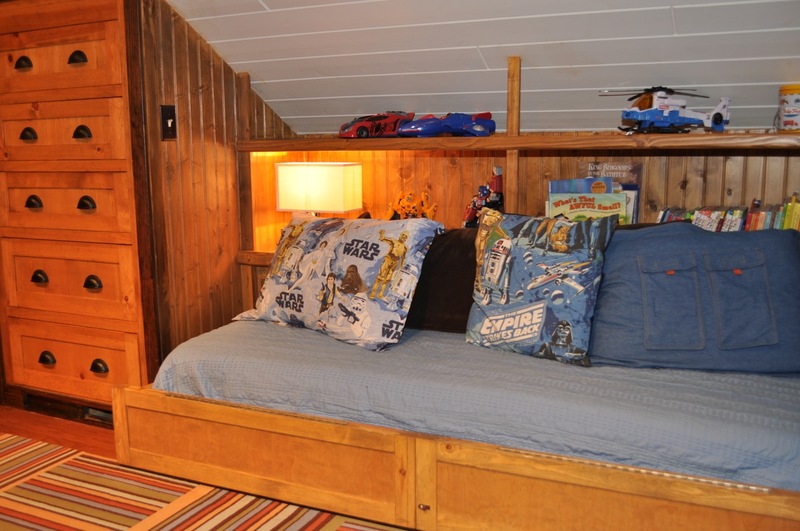 • Each trundle bed rolls out to full/queen size or half-way in for couch mode. When more room is needed for playing, the beds roll all the way into the wall. Almost makes me with I was a kid again! 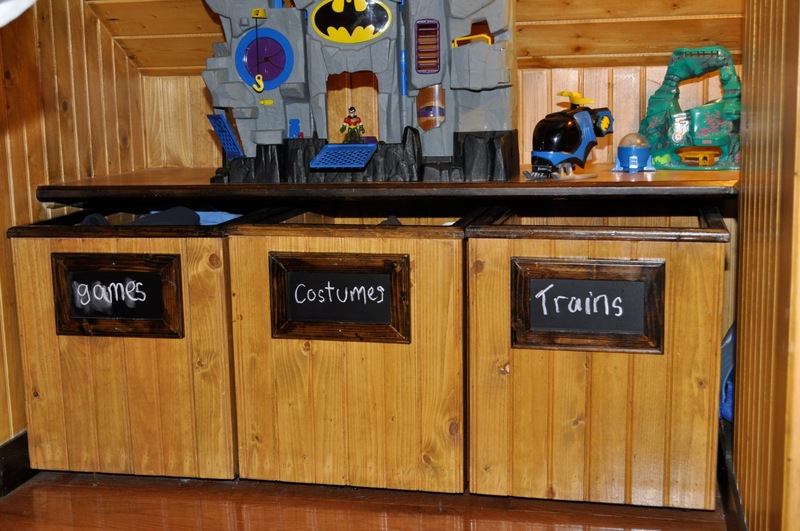 Just thought I’d add to my post from June on the Boys’ Bedroom. 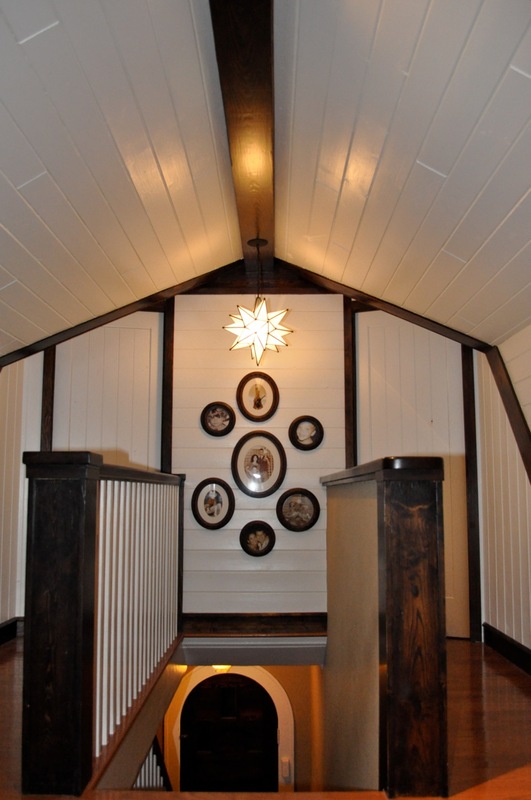 This is a view of the upstairs landing from the boys’ bedroom. People say the upstairs looks like the hull of a (small) ship. I have to agree that it’s pretty tight quarters, but we’ve tried to make it feel as roomy as possible. • The Wooden Arch— As I noted before, my brother-in-law carved the arch out from a tree branch that was in his yard. You can see the arched front door downstairs. 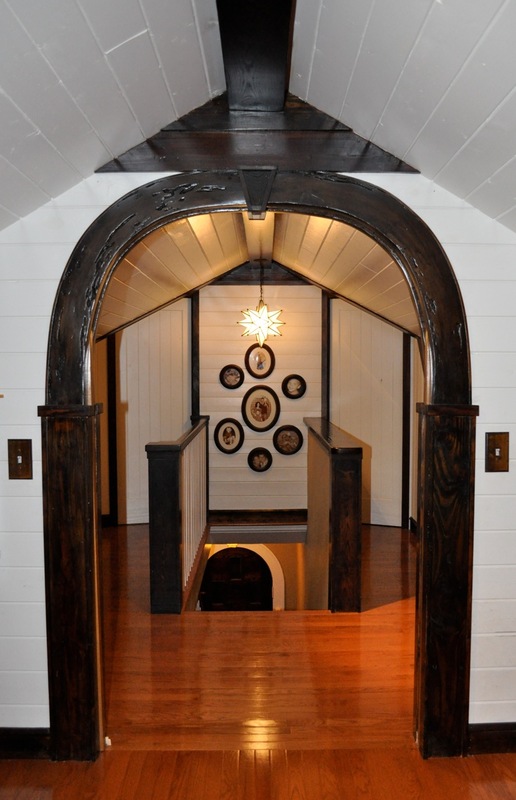 There are several arched doorways in our house, so we carried the arches upstairs as well. 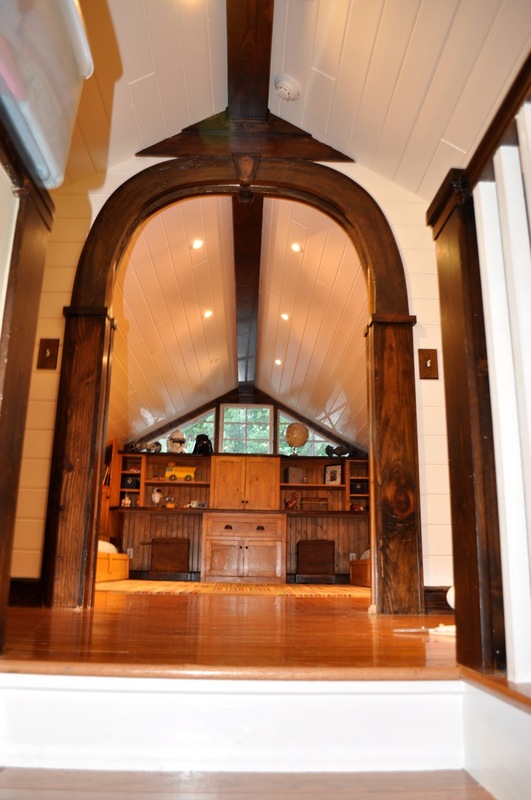 This arch has double pocket doors. 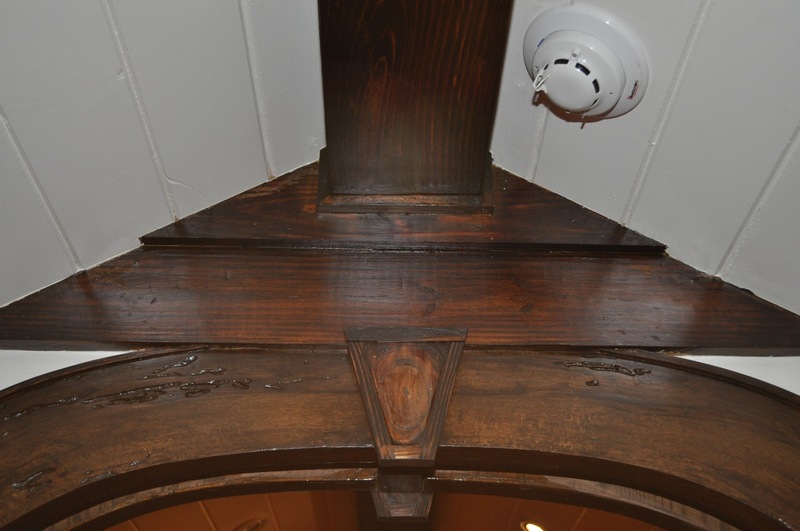 •Interior Colors Reflect the Home’s Brown and White Tudor Style— We painted the tongue-and-groove walls white with dark stained trim to family with the traditional brown and white tudor exterior. • The Star Light— If I had to pick a favorite thing, that star light would be it. 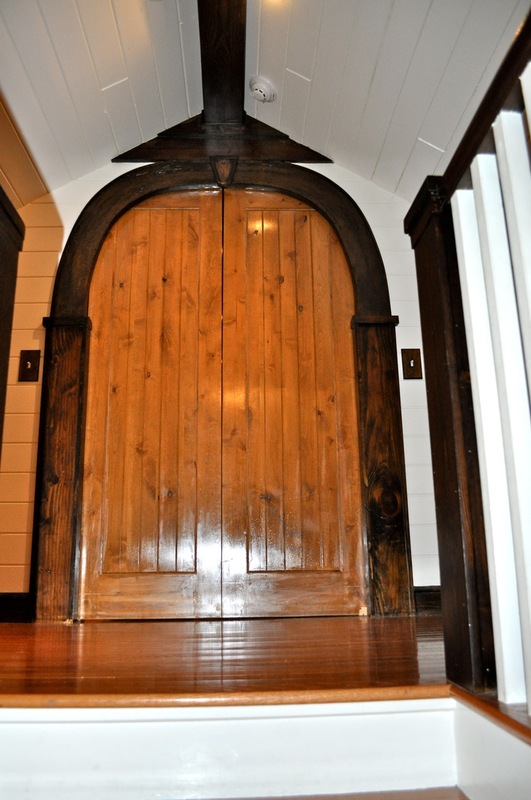 •The Other Rooms— The door to the left of the stairwell opens to the boys’ bathroom. And behind the door on the right is my husband’s office. 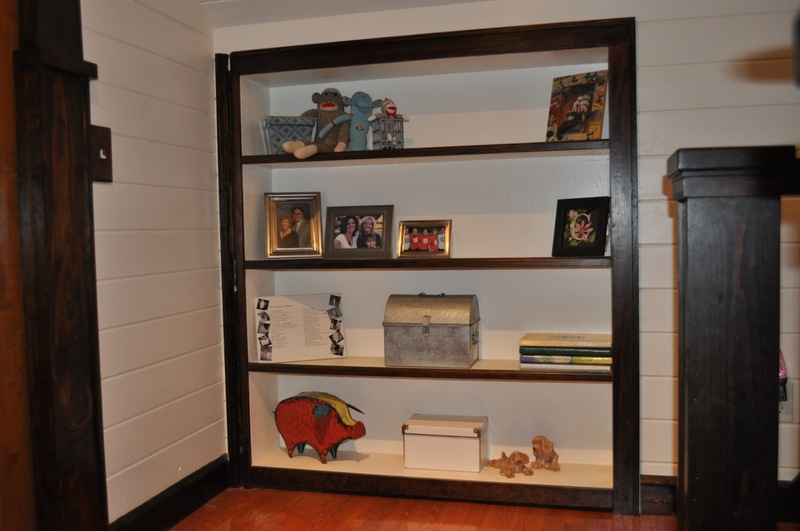 •Making Space for Storage— Wanting to make use of every available inch of space, we built shelves on either side of the upstairs landing that are actually “secret” doors to valuable attic space. 1. Shower—The bathroom turned out to be pretty big and with all the fantangled shower heads we put in, I kind of wish it was OUR master bathroom rather than the kids’! 2. 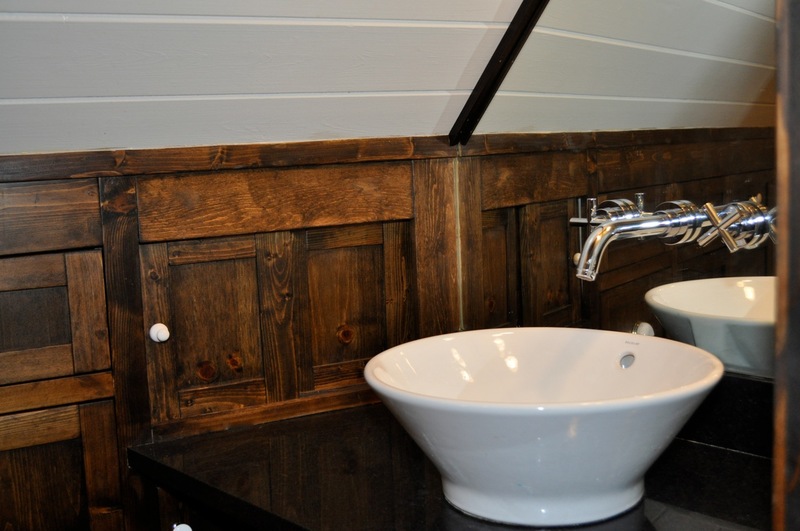 Cabinets— Four foot high custom cabinets flank one entire wall of the bathroom bumping up to the slanted ceiling. 3. 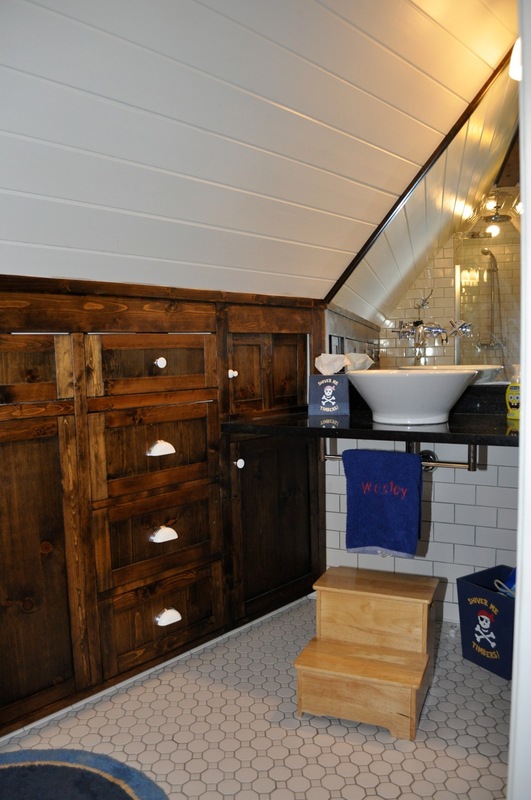 Secret Opening— The slanted wall to the left of the hanging red pirate hoodie towels actually leads to more storage space behind the shower. That’s where I keep my holiday decorations! 4. 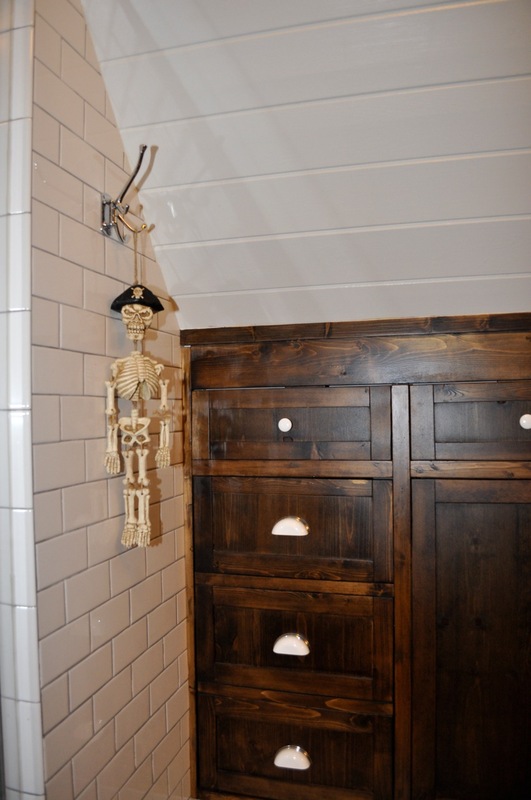 Pirate— That’s a pirate skeleton hanging on that towel hook. See “Ship’s Hull” reference. 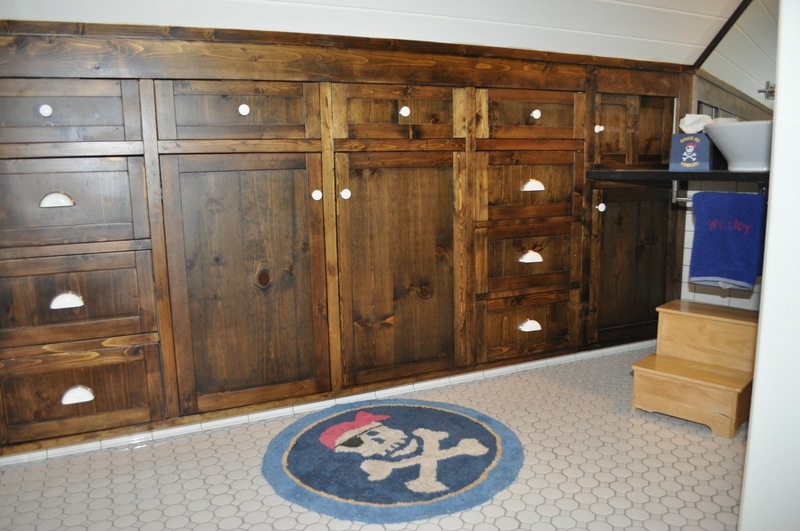 Hence, the pirate theme for the bathroom. 5. Mirror— In an effort to try and make the bathroom feel as roomy as possible, we had mirrors cut to fit counter to ceiling surrounding the sink. for you viewing pleasure. Enjoy! 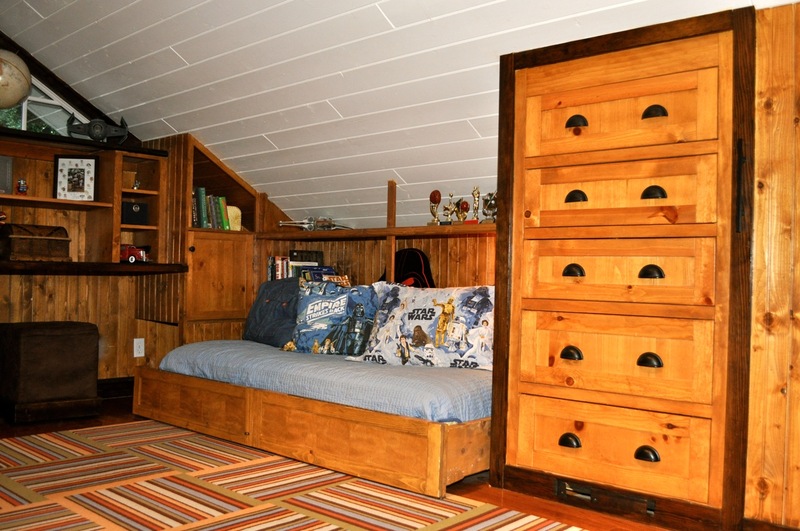 Enjoy this post on this Amazing Attic Renovation for a boy’s bedroom? 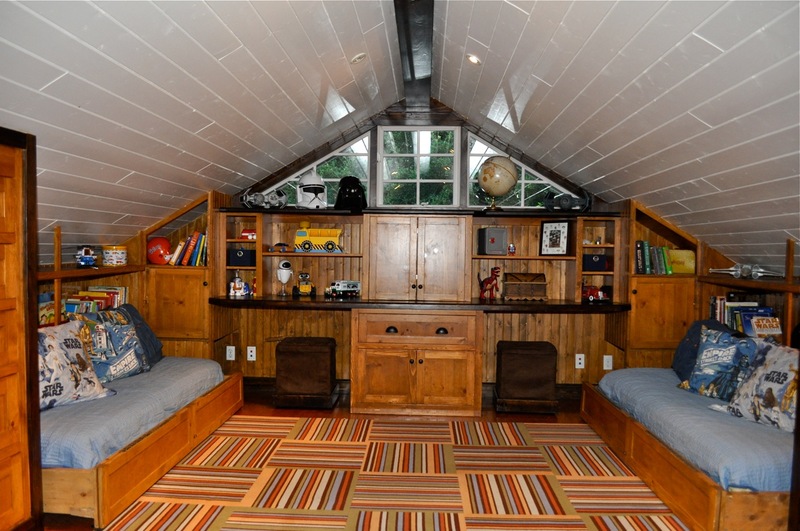 Check out our post on 25 + Bedrooms for Teen Boys. >This reno is bananas! How fantastic of a space is that! 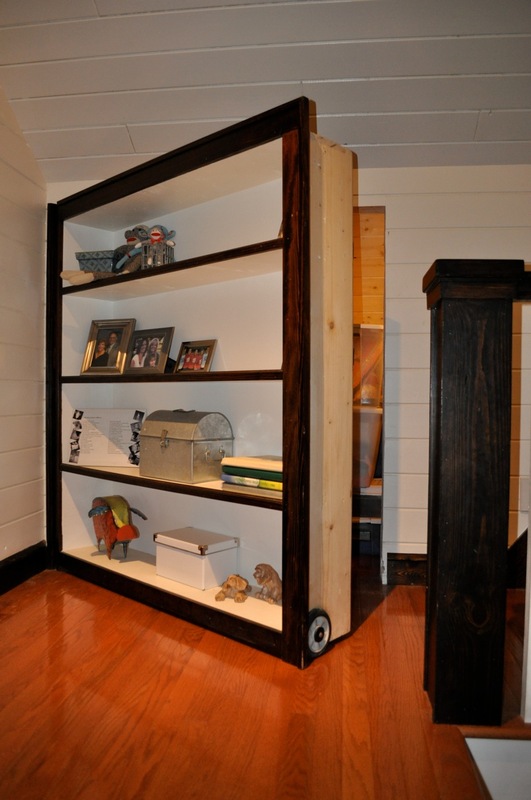 Love all the hidden storage and the way they really used the eave space. Insanely awesome! Thanks for sharing. >This is the best interior reno I've seen in a very long time. WOW. >Best redo ever! What an amazing use of space. 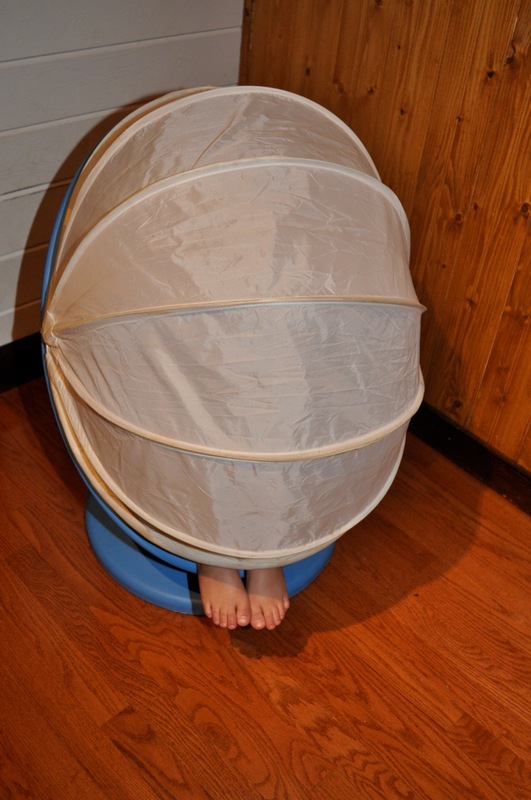 Smart and fun with plenty of room for little boys to become big boys. >This looks so amazing! It has such a cottage feel, like somewhere you'd stay on a beach vacation! >This is by far the most amazing renovation I have every seen!!! >Nevermind that I'm a 25 year-old woman. I'm jealous of this bedroom. >This looks so completely and totally awesome! I love all the little touches. 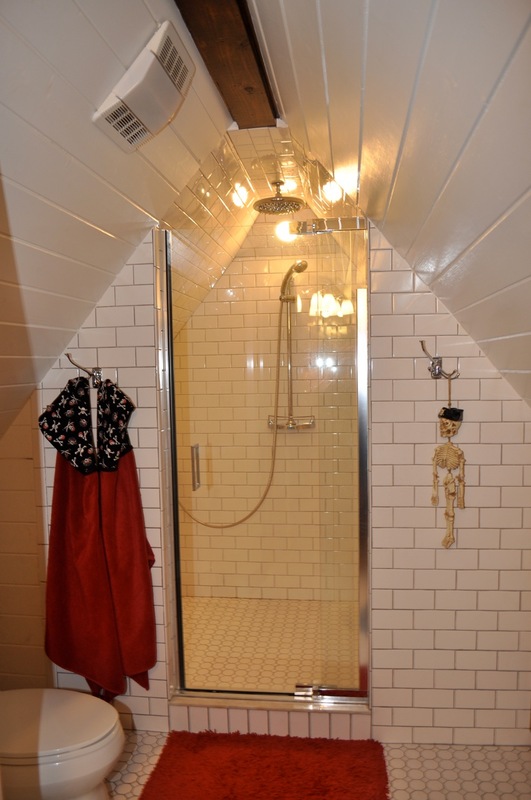 I've got an unfinished "attic" room that is a similar shape to yours that I would love to reno into a bathroom while still keeping storage so I'm glad I got to see how you used that space for a shower and so on. Thanks for sharing! >I would so sleep in that room if they won't! LOVE IT!!!! >Amazing. Every photo I kept thinking, 'this must have been SO expensive'. 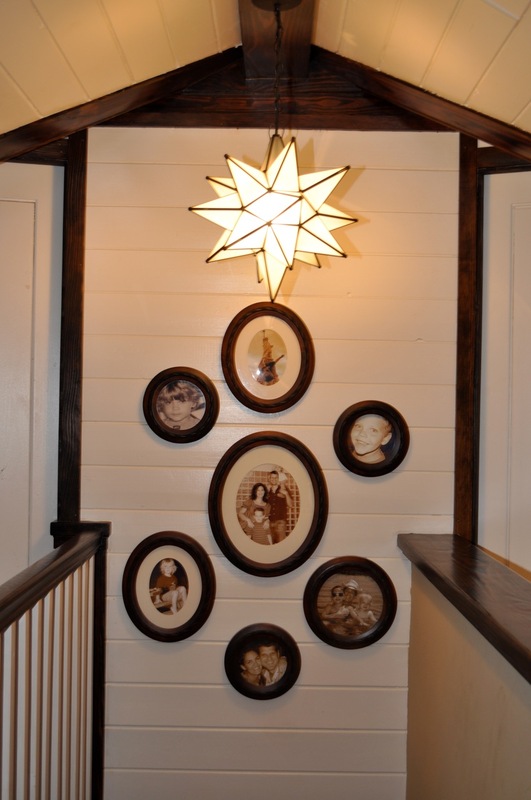 I love what you did and you totally customized the room to fit your family. You didn't cheap out on materials and it definitely shows. The room looks rich and amazing. >I don't usually comment, but this definitely deserves a comment. This is amazing!!!! >What a fantastic room! I wouldn't even mind living in it! >AMAZING!!! Mouth wide OPEN AMAZING!!! >OMG!! I what a fabulous redo! Great use of space. My boys would go crazy over it! Love the materials used as well. >Amazing! Wish that were my room! >I love this reno. I posted about it on my blog. Love your posts! It's fun to see what you have going on each day.